The Beard of Daruma was painted in the form of a snake (rather "Dragon"｢蛇＝龍｣) in the beginning. Why did it change to a tortoise? This image dates from 1777 and shows a Tumbler Doll Daruma with Saigyoo Hooshi (a famous poet, Saigyo Hoshi 西行法師). 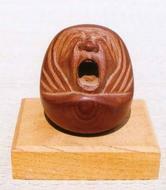 This is probably the oldest picture of a Daruma Doll. From then on Daruma became a popular theme. This illustration shows the face of this Daruma. His eyebrows are in the form of a crane and the beard clearly shows the form of a snake, or rather a wild dragon. 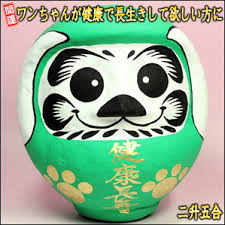 This is a modern classical Daruma Doll and as we can see the beard looks like a tortoise lifting its head. "The crane lives 1000 years, the tortoise 10.000 years" as a Japanese proverb goes. Both animals are symbols of longevity. But why was it a snake in the beginning? And for what purpose did it change into a turtoise? And what about the combination with a crane? Maybe the tortoise is the painted version of the deformation of the snake's head and the scales? I have checked out about the connection of Turtoise-Snake first and the story brings us back to ancient China. In Chinese culture, especially under the influence of Taoism (道教) the turtoise is the symbol of heaven and earth, its shell compared to the vaulted heaven and the underside to the flat disc of the earth. The tortoise was the hero of many ancient legends. It helped the First Chinese Emperor to tame the Yellow River, so Shang-di rewarded the animal with a lifespan of Ten Thousand Years. Thus the turtoise became a symbol for Long Life. This sone sculpture is part of a sarcophage of a Chinese aristocrat around 500, showing a turtoise entwined by a snake. The symbol of Zhenwu, the Protector God of the North, as tortoise and snake dates back to the third century B.C. This one (which is a little hard to see) we have an ink rubbing from a stele from the Pagoda of Six Harmonies in Zhejiang province, China, from about 1586. Here we see Zhenwu, the Perfected Warrior, standing on the back of a tortoise entwined with a snake. The two animals themselves where also used to represent the protector gods of the north. This tradition was carried over to Japan, where for example Tokugawa Ieyasu was very concious in choosing a place for his new capital, Edo, with a Mountain (Mt. Fuji) and the Dark Warrior in the north. During the birthday celebrations for a Chinese emperor, a crane and a turotise had to come forth and dance for him, praying for his long life. Then the emperor himself would perform a dance praying that his reign and life be long, his country be in peace and prosperous. You can find out more about Taoism and Zhenwu in the magnificent catalog about "Taoism and the Arts of China". The connection between a turtoise and a crane also dates back to China. The crane too was a symbol of Long Life and also the symbol of the relationship of Father and Son according to the Confucian philosophy. Furthermore the crane is a symbol of wisdom. When a highranking Taoist priest died, it was said he was "turning into a crane". In Japanese Buddhist art, we have a candle holder in the form of a crane standing on a tortoise (tsurukame shokudai 鶴亀燭台). This kind of temple decoration was often used by the New Sect of the Pure Land (joodo shinshuu 浄土真宗). Usually the crane was carrying a lotos flower with a long stem in his mouth and the flower was formed in a way to hold the candle. These types of illumination stands were produced since the Muromachi Period. At the famous Tooshoogu Shrine in Nikko, there is a huge monument in the form of Crane/Tortoise. There is a store that sells Tsurukame zabuton covers. In the tradition of Kaga Yuuzen, there is also a door curtain (noren) with this decoration as a wedding present for a bride. “Hanayome Noren”（花嫁のれん）is said to be the origin of " Kaga Yuzen" a sheet of cloth on which felicitous designs such as "Shoochikubai"(pine leaves, bamboo and plum flowers) or "Tsurukame"(crane and tortoise) are hand dyed and used as one of the bridal items. Finally a classic Noh-Play with this conspicious title. 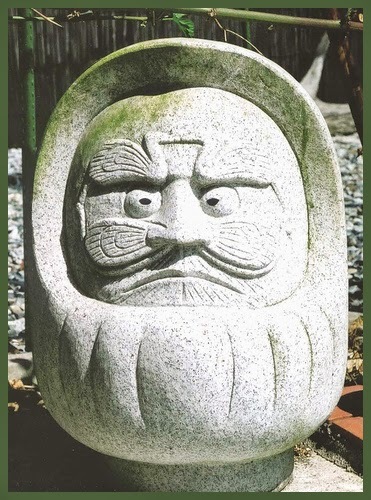 The famous Daruma from Shirawaka features more good luck symbols: The Pine/Bamboo/Plum with Crane/Tortoise. (Shoochikubai Tsurukame). The tradition goes back to Matsudaira Sadanobu (1758 -1829). 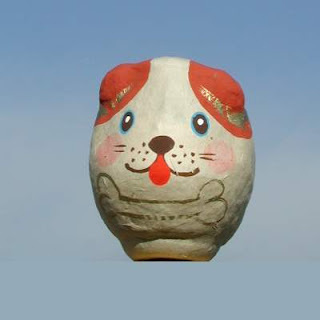 We still do not know when and why the snake changed to a tortoise on the face of Daruma, but we keep looking. 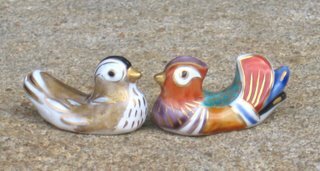 But the roots of these animals as symbols for good luck and longevity go way back to ancient China and the Taoist tradition. with Crane and Tortoise as his facial features in my collection.
. Turtle folk toys .
. Tsuru and Kame - kites from Izumo Shrine . The [baxia 霸下 . guifu (龟趺)], big tortoises which like to carry heavy objects, are placed under grave-monuments. The [bixi 贔屭], which have the shape of the chilong 螭龍, and are fond of literature, are represented on the sides of grave-monuments.
. hiiki 贔屓 / 贔負（ひいき) child of the dragon king . a wig for a dog ?
. . . CLICK here for Photos of dogs with wigs !
. 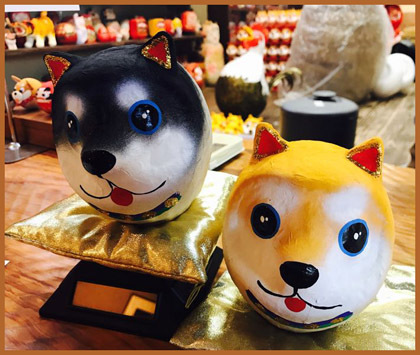 Inu Jinja, Inu-jinja 犬神社 /　伊奴神社 / イヌ神社　dog shrines .
. Inu 戌 /　犬　Dog toys and amulets .